San Francisco Bay Area Spray Foam Roofing Contractor Top in Nation. At the 11th Annual Spray Polyurethane Foam Alliance (SPFA) Award Ceremony, Wedge Roofing was the recipient of the 2016 SPFA National Industry Award for "Best Spray Foam Roofing Project under 40,000 square feet" for their work on the Small Precision Tools – USA Facility in Sonoma County. 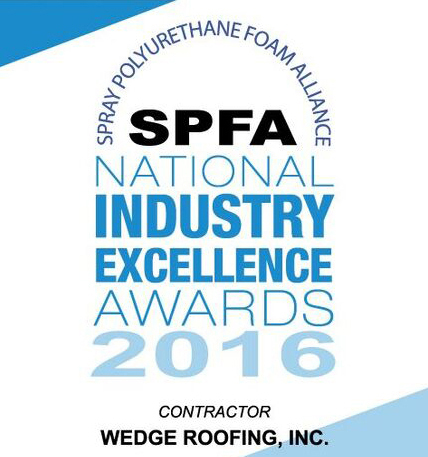 This is Wedge Roofing's second SPFA Industry Excellence Award, having also won the prestigious award for spray foam roofing in 2015. Competing against industry leading projects from across the country, Wedge Roofing’s design and build of this high-tech spray foam roof - manufactured by Spray Foam Products - was judged to be the best roofing project in the country. Nominations were judged independently by a national panel of industry experts on value for money, speed of delivery, environmental sustainability, innovation, best practices, problem-solving, and risk mitigation. In addition to accepting Spray Foam Industry's highest award, Wedge Roofing General Manager, Gary Harvey instructed five classes at the Spray Foam Expo on the proper methodology for installation of spray foam roofs for commercial and residential buildings. SPFA (Spray Polyurethane Foam Alliance) is the voice and educational arm of the polyurethane foam industry. SPFA delivers training, industry certification, leadership on energy conservation, the environment, health & safety, building codes and technical advances in the industry. Members are professional contractors, manufacturers and distributors who strive to educate, regulate and improve the trade.